I awoke to a disappointing sight the other day, some fiend had meandered through my front yard, pooping, and eating leaves off plants. This would be bad enough, but what is worse, it tried to climb up my honeycrisp apple tree, and then I assume out onto the two lowest scaffold branches, and it broke both of them. So now my tree is permanently mutilated. You can’t replace primary branches easily or quickly. I can tell where the creature, undoubtedly a groundhog I’m sure, entered my yard. It ate the leaves off a new paw paw tree I had just planted. Then ate the top growth off my single small boysenberry plant. Waltzed across the driveway, ate 3 or 4 small petunias I had just planted, ate all the small leaves off the lowest branches of my yellow delicious apple tree, ditto on my honeycrisp apple tree, which it then climbed to destroy my primary branches. Then it continued to eat the tops off some hardy hibiscus, and finally off to the neighbor’s yard. It figures too. I had just critter-proofed my back yard. Nothing bigger than a squirrel can get in the entire backyard now (not unless it can climb a 6 foot privacy fence). I had to do it because every once in awhile a skunk will wander in, and my toddler son has no idea that a skunk is not a dog or a cat and would probaby run at it waving and screaming and that is not something I wanted to deal with. Not that I needed much arm twisting to do so, having dealt with groundhog damage over the years. But, now they’re hitting my front yard, the devious rodents. So, I learned a lesson. I normally leave limbs on trees as much as possible, to provide more leaves, and thus more energy for growth. 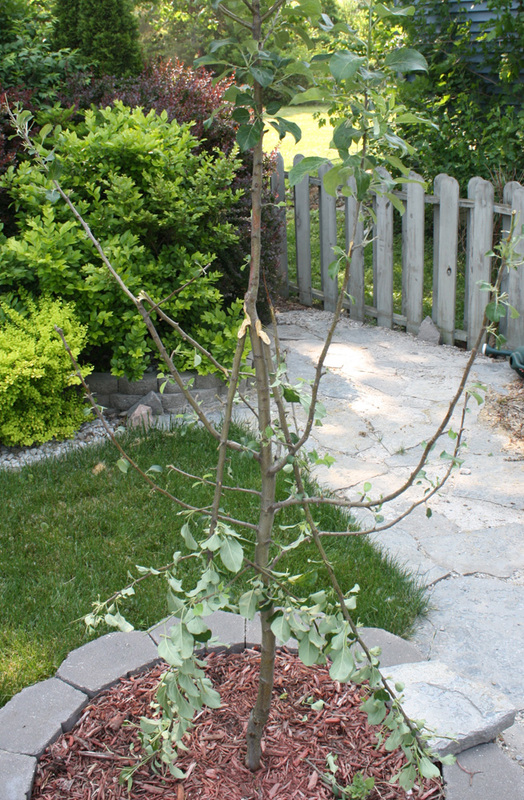 But I immediately went out and pruned off all the small lowest branches on my dwarf apple trees. On the honeycrisp the critter had used these small lowest branches as a ladder to reach the higher and thicker (and far more important) primary branches, which it then tried to climb to the end of, until the branch snapped. Then the stupid thing went back and did it on the other side. The point being, without the ladder-like small lower branches, I don’t think it could have reached so high. So, from now on, I’ll remove the option of climbing the tree. Now, hopefully, I just have to worry about them gnawing at the trunk. I, too, have lost a HoneyCrisp to intruders. I feel your pain. Unfortunately mine was girdled – applewood is oh so tasty in January – and had to be replaced. I was two years into it and looking forward GREATLY to seeing some fruit the next season. My new tree is going strong, but a long ways away from producing…sigh. A few more seasons of paying $3/lb before I reap the rewards. Has yours been producing? No production yet. The yellow delicious I planted at the exact same time has fruit this year for the first time (But it is a spur-type tree and so fruits on secondary branches, as well as tertiary ones). I figured the honeycrisp would be next year. It is my favorite apple and I too tire of paying $3 a pound. With the inflation going on, I wouldn’t be surprised if it went up to $4 by the fall when they’re in season. My local grocery store just raised seedless watermelons (something I tend to buy twice a week in the summer) from $3.99 to $4.99. That’s a very sad looking apple tree! Much as I love nature in my garden, I do get frustrated when a critter ruins something I just paid for and planted. I’ve resorted to making small rolls of fencing wire to put around new plants. Once the plants are established a bit of nibbling isn’t usually too bad for them. Do you think there’s any chance the apple tree will recover? I like your solution of removing lower branches on apple trees in future. Thanks for sharing. I feel your pain. I can only grow deer resistant plants outside my fence. Rabbits and voles damage plants inside my fence. There’s always a critter after something! Groundhogs aren’t big climbers, raccoons otoh, are and are well adapted to urban living… they will eat plants and such. They make big poops too. I haven’t a problem with them (dogs discourage them) but I am told that hair clippings from a local barber and/or grooming salon will make critters think there’s people and dogs nearby and discourage them. You can also get some 1/4 mesh hardware cloth/wire and make tubes to keep trees from being girdled. Putting the cut (sharp) ends up might discourage climbers too. A small, cheap electric fence charger and a strand or two of wire run around the property a few inches off the ground will zap groundhogs and raccoons alike.